Louis D. Brandeis: A Biographical Sketch. De Haas, Jacob; Louis D. Brandeis. New York: Bloch Publishing Company, 1929. First edition of this early biography of Justice Brandeis. Octavo, original cloth. 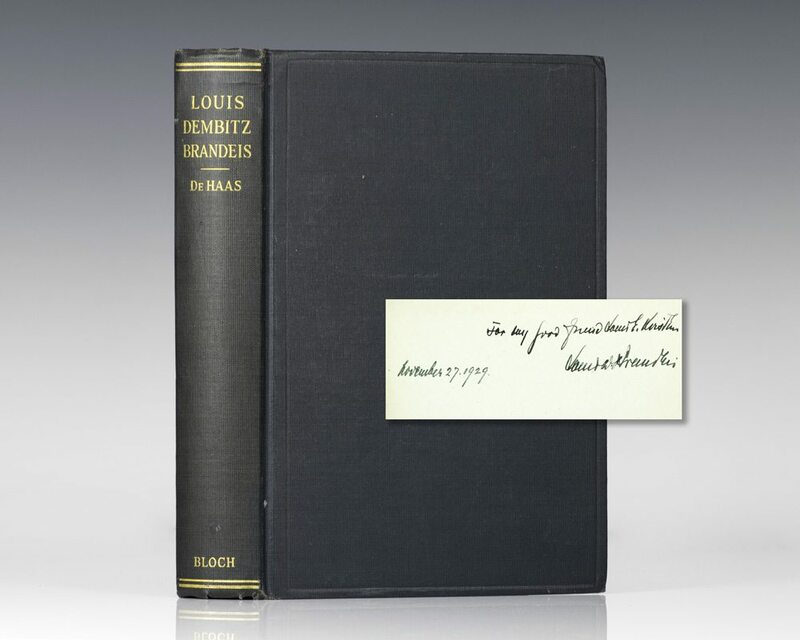 Inscribed by Louis Brandeis on the front free endpaper in the year of publication, “My good friend Louis E. Kirsten November 27, 1929 Louis D. Brandeis.” In near fine condition. With special reference to Brandeis’ contributions to Jewish and Zionist history with full text of his addresses delivered from 1912 to 1924. Books signed by Brandeis are uncommon. Louis Brandeis was an American lawyer and associate justice on the Supreme Court of the United States from 1916 to 1939. He was born in Louisville, Kentucky, to Jewish immigrant parents from Bohemia (now in the Czech Republic). He attended Harvard Law School, graduating at the age of twenty with the highest grade average in the law school's history. Brandeis settled in Boston, where he founded a law firm (that is still in practice today as Nutter McClennen & Fish) and became a recognized lawyer through his work on progressive social causes. In 1916, President Woodrow Wilson nominated Brandeis to become a member of the Supreme Court. His nomination was bitterly contested, partly because, as Justice William O. Douglas wrote, "Brandeis was a militant crusader for social justice whoever his opponent might be. He was dangerous not only because of his brilliance, his arithmetic, his courage. He was dangerous because he was incorruptible... [and] the fears of the Establishment were greater because Brandeis was the first Jew to be named to the Court." On June 1, 1916 he was confirmed by the Senate by a vote of 47 to 22, to become one of the most famous and influential figures ever to serve on the high court. His opinions were, according to legal scholars, some of the "greatest defenses" of freedom of speech and the right to privacy ever written by a member of the Supreme Court.